(GCR) The costs of building stadia for Russia’s 2018 World Cup are rising and the government has launched a ministerial inquiry into why. The move comes as the government has cut overall World Cup spending by 10% in response to rising inflation and the devaluation of the ruble. That cut does not include stadia construction costs, although the government has said it will seek ways of bringing stadia costs down by considering temporary seating, cutting import duties and abolishing mandatory bank guarantees. Russian sports minister Vitaly Mutko said on 29 January that the costs of building the football stadiums were on the increase and that the Ministry of Industry and Trade had been ordered to look into the legitimacy of the price increases. When it won its bid to host the 2018 tournament, Russia promised football governing body Fifa that it would provide 12 stadia for the games. Of these, two are already complete, one in Sochi needs its roof taken off, and two more are being upgraded. Seven are to be built from scratch. “We have ordered contractors to consider financial adjustments to the project,” he said. “They will be minor changes,” he said. Mutko also said that Russia would cut its total World Cup budget by 10%, excluding spending items on the infrastructure. Russia’s ruble has fallen sharply over the past few months to a record low of 75 rubles to the dollar in mid-December. The total budget of 664.1 billion rubles was worth approximately $20.5bn when it was announced in 2012, but at current exchange rates this figure drops to around $9.6bn. 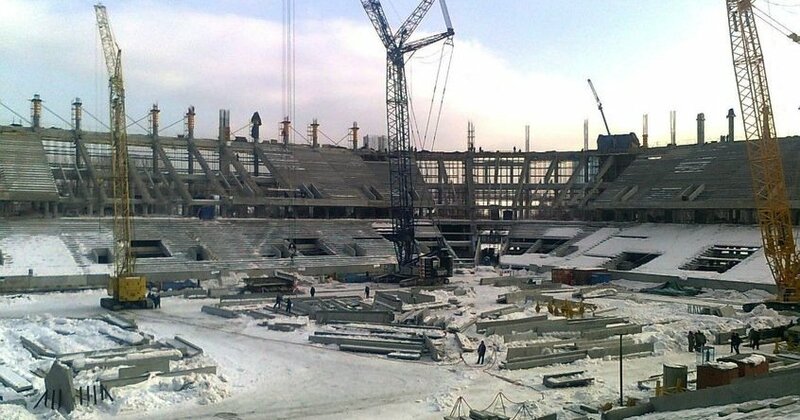 A total of 300 billion rubles (over $4.5bn) was set aside for the construction and refurbishment of the stadia. On 22 January the government said it was considering measures to cut these costs, including providing temporary seating, abolishing mandatory bank guarantees, and zero tax duties on imported construction materials, TASS reported. This entry was posted in New Construction, World and tagged cost, russia, stadium, world cup. Bookmark the permalink.